It’s 25th November!! Which means that it’s exactly one month ‘til the Big Day! And it is definitely beginning to feel a lot like Christmas – here at Red Candy HQ in Birmingham the Christmas lights are shining bright and the famous German Christmas Market is open for business! And across the country, the proverbial Christmas Spirit has arrived in the form of the Coca Cola advert. However, if the realisation that the holidays are indeed coming fills you with horror rather than excitement, it probably means that you haven’t started your Christmas shopping yet! Well, fear not friend! Red Candy is here to help you. We have more gift ideas than you can shake a stick of festive rock at – starting with these Top 10 Gifts for Him. It is common knowledge that males are extremely hard to buy for – so if your go-to gift for your guy is a pair of socks and you want to up your game, then check out the gift guide below! Coming with a rather swish black velvet pouch, this set of nine nifty whiskey stones will ensure that your fella’s favourite tipple remains perfectly chilled and completely undiluted (and will also keep Santa happy when he arrives down the chimney!). A perfect stocking filler! Nuts are a traditional Christmas snack so why not combine this festive treat with your son / dad / hubby’s love of robots?! These fun designer nutcrackers are great gifts for boys who still love their toys! If your man loves his music, and his most cherished possession is his record player, then this Nextime Vinyl Clock is the perfect pressie for him! ‘Nuff said! Home guards may not have gone to war, but they took a strong stand for keeping the domestic peace at home. And these particular troopers are determined to protect your home from the very real domestic threat of slamming doors and falling books! These quirky comrades make a great nostalgic present for those who grew up playing with toy soldiers and watching Dad’s Army. Inspired by classic funny book exclamations these Comic Sofa Cushions are a funky gift for those with a silly streak who love comics and retro design. If your intended recipient is a classic comic or cartoon lover then this might be just the gift you’re looking for! 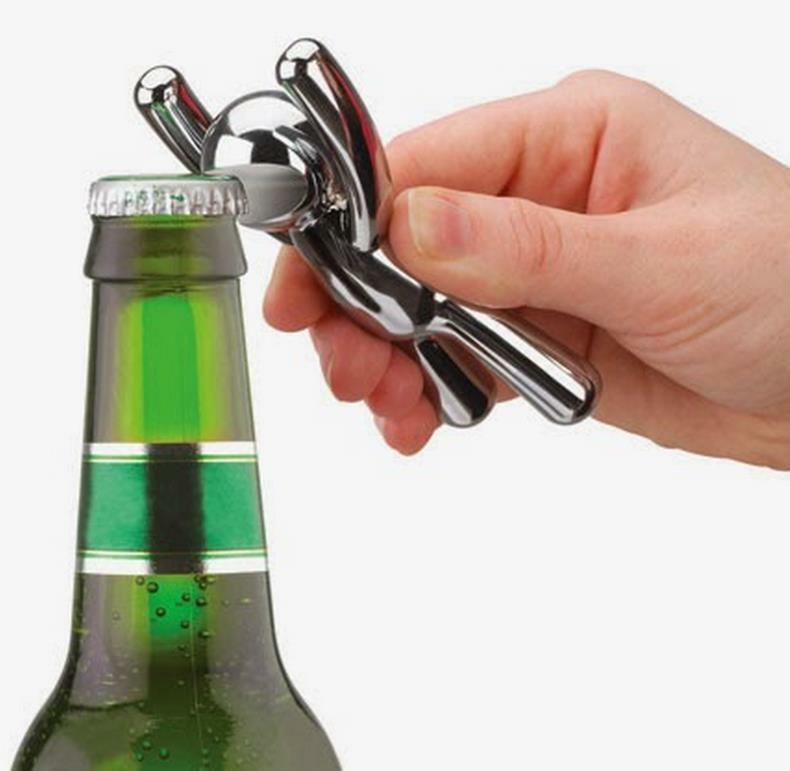 If your OH is always losing his bottle opener then let the Umbra Drinking Buddy Bottle Opener save the day with his mighty mighty mouth! This funky character makes a great stocking filler, and means that the beer will keep flowing this Christmas! The perfect gift for those workaholics, this skyline desk tidy adds a sense of style and fun to the working environment. So if your friend is a tough cookie to buy for because he never leaves his desk, then this is the perfect present for him. Make sure he takes enough time off to enjoy the festivities though! These gorgeous glasses turn every tipple into an experience to be savoured. The perfect gift for whiskey connoisseurs, these glasses come in a set of two meaning that you can enjoy your tipple of choice together! Check out the Gifts For Him section of our website!